A drunk Orange County plastic surgeon reportedly disfigured at least a half dozen patients before losing his license. A Rocklin anesthesiologist was arrested for taking anesthesia through an extra IV line while administering it to a patient. A meth-using doctor who was convicted of drug dealing will get his doctor’s license back after a year. 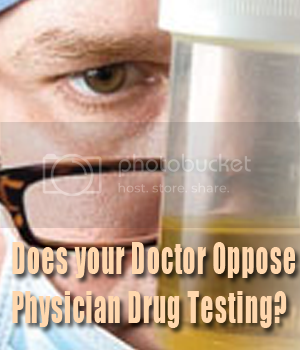 Does your doctor oppose mandatory drug testing for physicians? Check the list. Substance abuse among California physicians is higher than the general population, yet unlike bus drivers and pilots, physicians don’t have to take drug tests. A proposed patient safety ballot measure requires mandatory drug testing of physicians, but a group of doctors is raising big bucks to stop these and other common sense patient safety measures. Consumer Watchdog has published the list of doctors across the state who have given money to the opponents of the Troy and Alana Pack Patient Safety Act. We think patients should know if their doctors are standing in the way of their safety and will be sharing the list with millions of Californians. Troy, 10 years old, and Alana, 7, were hit and killed by a drug abusing driver prescribed thousands of pills by negligent physicians. Their dad, Bob Pack, is the author of the ballot measure to create mandatory drug testing among physicians, require doctors to use an electronic prescription drug database and modernize patient safety laws. Check the list and ask your doctor if he or she opposes modest patient safety reforms. It’s time for the medical establishment to explain why it is resisting common sense solutions to weed out the small number of dangerous and dirty doctors that commit the vast majority of medical malpractice. Posted by Jamie Court, author of The Progressive’s Guide to Raising Hell and President of Consumer Watchdog, a nonpartisan, nonprofit organization dedicated to providing an effective voice for taxpayers and consumers in an era when special interests dominate public discourse, government and politics. Visit us on Facebook and Twitter.